Home / News / Unbelievable / Viral / Sa Kauna-unahang Pagkakataon Ay Tinanggal Nila Ang Tubig Sa Lagusan Ngunit ‘Di Nila Inasahan Ang Kanilang Natagpuan. Sa Kauna-unahang Pagkakataon Ay Tinanggal Nila Ang Tubig Sa Lagusan Ngunit ‘Di Nila Inasahan Ang Kanilang Natagpuan. Paris has been known as the “City of Love” and the “City of Lights”. The whole city is enticing enough to be visited by people from all over the globe. 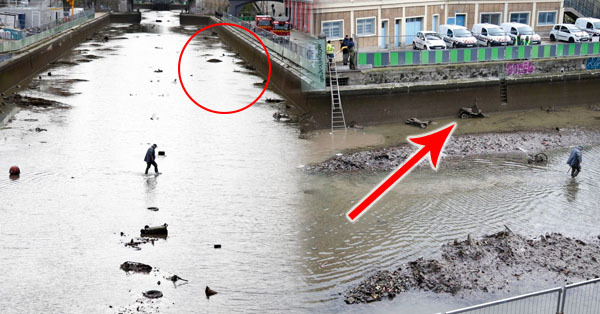 However, little did we know, Paris has one of the dirtiest, oldest and most beautiful waterways called the Canal Saint-Martin which measures a 4.5-kilometer long. Since 2001, the canal has remained untouched and uncleaned. But recently, the city authorities decided to finally drain and clean the waterway. During the process, they expected to find beer cans, plastics, and some stuff we would usually spot in a canal. What surprised them was when they discovered thousands of artifacts which brought back nostalgic memories. The Canal Saint-Martin was originally created to supply fresh water in the whole city of Paris. Its construction was ordered by the French statesman and known military leader, Napoleon I in 1802. Apparently, as the city grew, the 4.5 km canal became a watery garbage dump. People who worked on cleaning the canal had to go into the polluted water to get the garbage out. According to reports, they have successfully removed over 40 tons of junk and more. Residents watch the cleaning operations and are amused by the interesting objects pulled from its depths. Aside from a lot of wine bottles, bicycles, motorbikes and some everyday dirty stuff, they also have found items which have significant value from the past. Such as boom boxes, retro cameras, and some supposed artifacts from World War I like coins, an unexploded shell, and a car. However, since the cleaning took them days to finish, they had to move over four tons of fish to a safer place. This is done to avoid contamination. A lot of residents from the area visited the canal to witness the process. They were obviously curious about what could have been there for more than a decade. Look at the series of photographs below to see the amazing stuff they’ve discovered from the canal! What can you say about this amazing discovery? Maybe we could clean and drain other dirty canals too; we never know what’s in there! Let us know your thoughts in the comments section below!